Dear solo travellers and non-solo travellers, do you have any questions about the Ronda City in Spain? 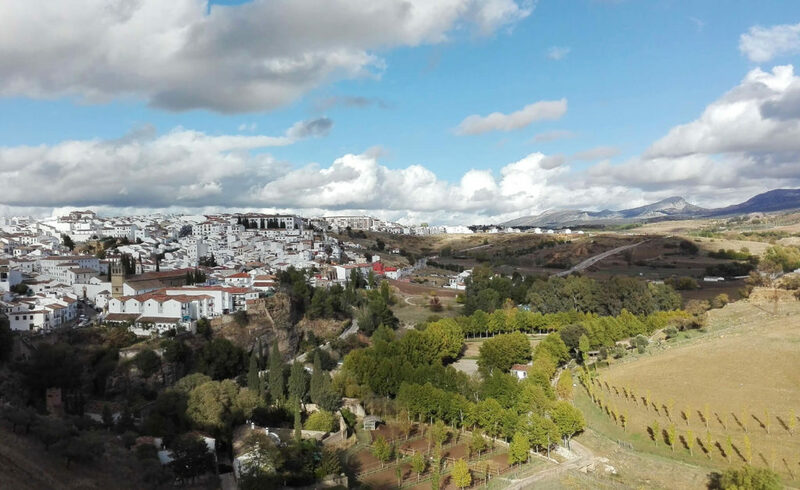 Are you wondering how to get to Ronda from Malaga, when to visit this pretty white town or where is the nearest airport? Lucky those who found this page will get answers to the most common questions about this Andalusian town. Read them before you visit Ronda and get ready for the adventure! Just a quick note: this Andalusian town is called Ronda. There is no Rhonda in Spain, as far as I know. 1. Where is Ronda in Spain? One of the common questions is What is Ronda and Where in Spain it is. Even though it has become one of the most popular destinations in Andalusia, it might be still unknown for many (solo) travellers. Ronda is a small white town or village in Spain, located in the south-western part of Andalusia. It is situated 100 km west of the biggest Andalusian city of Malaga and 133 km south-east from the capital of Andalusia – Sevilla. What makes this Spanish Pueblo Blanco (white village) so special? It definitely is the rocky land it was built on! Ronda’s altitude is 739 m above sea level. It was constructed directly on a deep and narrow gorge named El Tajo. Thanks to its high positioning it offers one of the most incredible views in Spain. 2. What’s Ronda’s Nearest Airport? The nearest airport to the wonderful Spanish village of Ronda is in Malaga, which is about 95 kilometres (1h 19 min) by car. The second closest airport is located 116 km (1 h 36 min) in Jerez de la Frontera, the third closest airport to Ronda is in Sevilla. The journey from Sevilla’s airport to Ronda takes approximately 1h 44 minute. 3. How to Get to Ronda? This really depends on where you’re heading from. To get to Ronda by any of the closest airports you can use a car hire, blablacar.es, you can take a bus or a train. How to Get from Malaga to Ronda: The journey from Malaga’s María Zambrano main train station takes a little over 2 hours and costs around €14.00. There is also a slightly cheaper bus for €11.00 but the journey takes around 20 minutes longer. How to get from Sevilla to Ronda: It takes approximately 1h 44 minutes by car to get from Sevilla’s airport to Ronda. The bus departs from the main Sevilla bus station Prado S.S, takes 2h and 45 mins and costs €12,71. There are 7 buses a day. There is no direct train from Sevilla to Ronda. You have to change in Bobadilla and the waiting time can last for hours. 4. For how Many Days Shall I Visit Ronda? That’s a brilliant question. How I’m explaining in the article What to do in Ronda for one Day, Ronda is such a stunning place that even a short stopping by to see the magnificent views can make you happier. To enjoy the place in its fullest I’d recommend at least 2-3 nights. I’ve stayed overnight for two times and still get the feeling I haven’t explored all the lovely corners and beautiful views of Ronda. If you go there mainly for the views, Ronda’s old town and exploring Arabic history then 3 or 4 nights would be perfect. There are also many hiking trails around so any adventurous hiker wouldn’t get bored even after 2-weeks stay. 5. When to Go to Ronda? There’s never a perfect answer to this question. Unpleasant weather can appear anytime and everywhere. The coldest average temperature is 10°C (50°F) in January and the warmest average temperature is 24°C (74°F) in July. October, November and December can be pretty wet with an average rainfall of 58 mm a day. The holiday-weather.com claims that the wettest month is November. If you want more sun shining over the gorgeous views you should choose May, June, July, August or September. 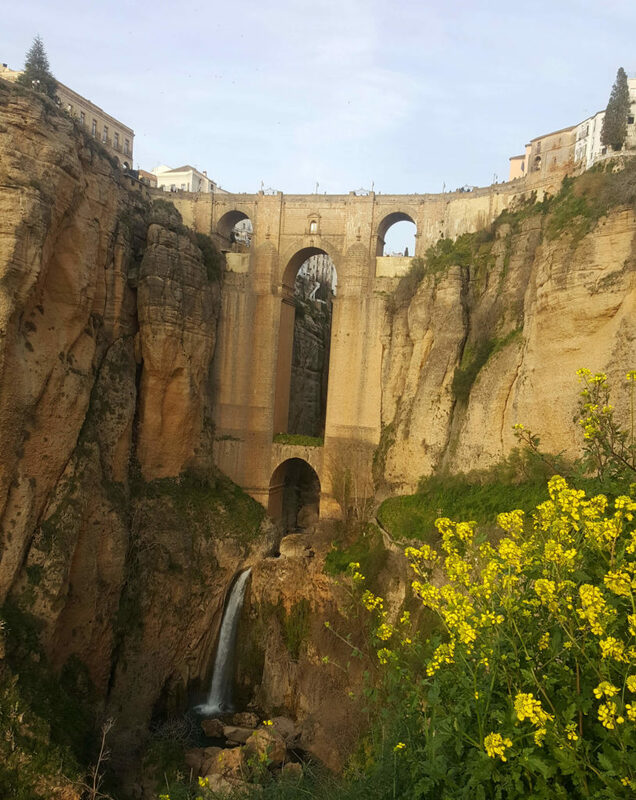 I visited Ronda in the middle of November and the end February. It was raining the first day we arrived in Ronda in November but after an afternoon shower the sun showed up and it was pretty nicely warm. However, the November night in Ronda was less pleasant as it was both freezing and humid. The weather was amazing when we visited Ronda city in February. It was sunny on both days with a daily temperature of 19°C! Believe me, 19°C on sun in Andalusia can feel like 25! Again, the night was more or less coldish with just around 6 degrees. 6. What is the Population in Ronda City? As mentioned before, Ronda is a small town or rather a bigger village. 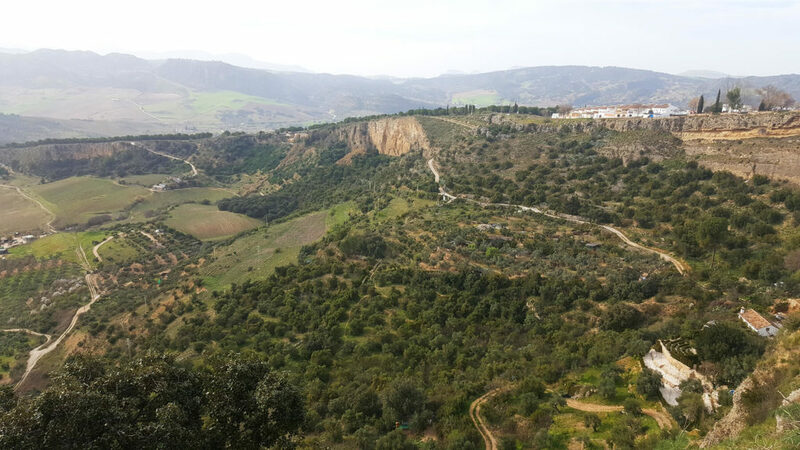 Current population of Ronda is approximately 35 thousand of so called ‘Rondeños’. 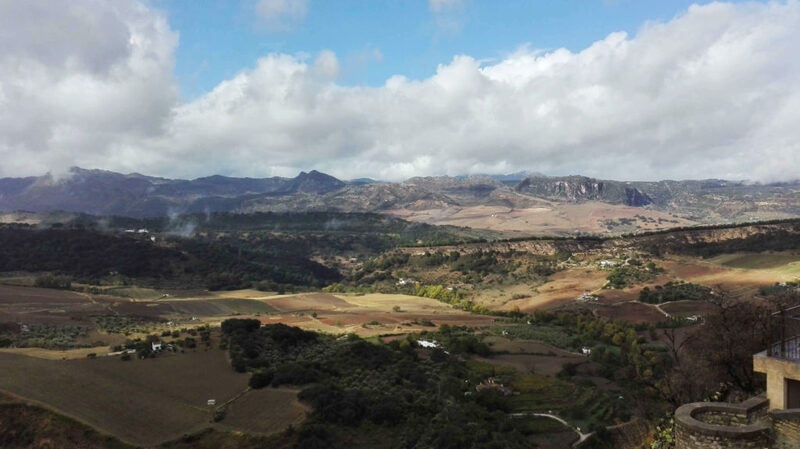 Most of Ronda’s population lives directly in the city, the rest is divided between the villages near Ronda: Serrato and La Cimada on the north, and Montecorto and the Villalones on the west. 7. Are There Any Vineyards near Ronda? Yes, there are, and the locals call them Bodegas. While all the vineyards near Ronda are situated 750 metres above sea level, you can find mostly red wines: Cabernet Sauvignon, Merlot, Syrah and Tempranillo. The most popular Ronda’s Vineyards (a.k.a bodegas) offering wine testing according to Tripadvisor reviews are: Bodega Garcia Hidalgo, Dona Felisa Winery, Joaquin Fernandez Bodega, Bodega Descalzos Viejos, Bodega Kieninger, Bodegas Cortijo Morosanto, Cortijo Los Aguilares, Bodega F. Schatz. Ronda has also a deep wine history. There is an ancient Roman city of Acinipo just 14 kilometres outside of Ronda. The city used to be an important wine region of the Roman empire. It’s said that the wine made in Acinipo, a village near by Ronda, was so good that it was exported directly to the capitol of the empire – Rome. 8. What did Hemingway do in Ronda? Ernest Hemingway travelled to Spain during the Spanish Civil War to report the status about the cruel battles between north and south of Spain for the North American Newspaper Alliance. As a great bullfighting enthusiast (forgive him, please), he arrived in Ronda to see the local bullring about which he had heard many astonishing stories. The other thing the famous writer loved about Ronda were unsurprisingly the gorgeous views and cute white village houses.